Work with the Tin Man in FarmVille A Nod’s as Good as a Winkie, in FarmVille Emerald Valley Chapter 3 Quests. The Winkies made him a King therefore making him awfully busy. After all ruling a Kingdom requires much attention and care. We will help him with on this quests. Info: Crafted in the Craftshop and will need Whirling Buds Bushel x3, Jade Spiralis Bushel x3 and Crystal Cranberries Bushel x3. 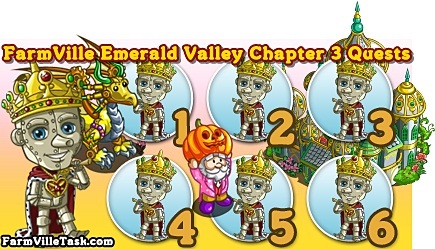 Emerald Valley Chapter 3 Quests 2: FarmVille Winkie Architect? Sure! Info: Will need the following bushels Red Poppy Bushel x3, Emerald Rye Bushel x2 and Unfolding Plumeria Bushel x3. Info: Will need the following bushels Bitty Blue Tomatoes Bushel x3, Emerald Rye Bushel x3 and Yellow Brick Beets Bushel x3. Info: Crafted for 5 min and will need Magic Feed x2. Info: Crafted for 10 min and will need Enchanted Eggs x2 and Enchanted Water x2. Info: Crafted at a level 3 Porcelain Shop and will need Yellow Brick Beets Bushel x3, Azure Corn Bushel x3 and Mini Eggplant Bushel x3.